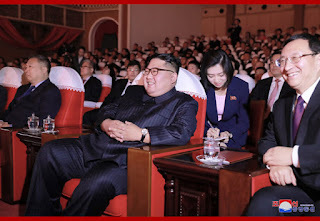 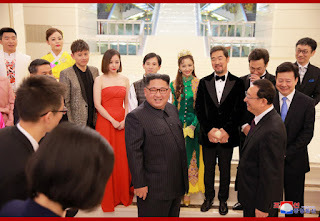 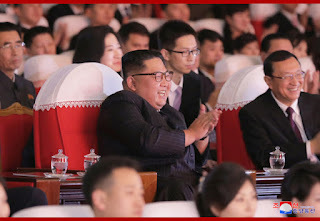 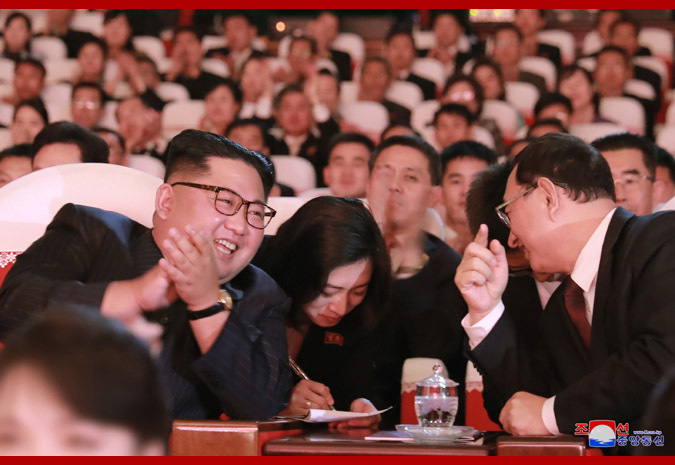 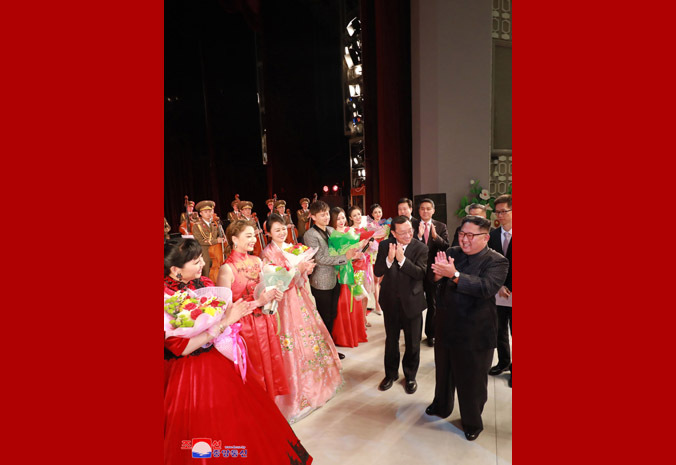 Pyongyang, November 4 (KCNA) -- Kim Jong Un, chairman of the Workers' Party of Korea, chairman of the State Affairs Commission of the DPRK and supreme commander of the Korean People's Army, enjoyed a joint performance by the DPRK and Chinese artistes at the Mansudae Art Theatre on Nov. 3. The performance was appreciated by Choe Ryong Hae, member of the Presidium of the Political Bureau of the Central Committee of the Workers' Party of Korea (WPK), vice-chairman of the State Affairs Commission of the DPRK and vice-chairman of the C.C., WPK; Ri Su Yong, member of the Political Bureau and vice-chairman of the C.C., WPK; Kim Yo Jong, alternate member of the Political Bureau and first vice department director of the C.C., WPK; Pak Chun Nam, minister of Culture, members of the C.C., WPK, creators, artistes and teachers in the field of culture and arts. 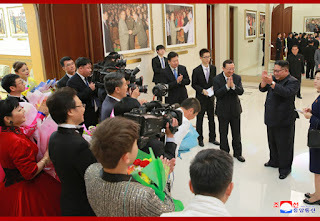 Present there on invitation were staff members of the Chinese embassy here. 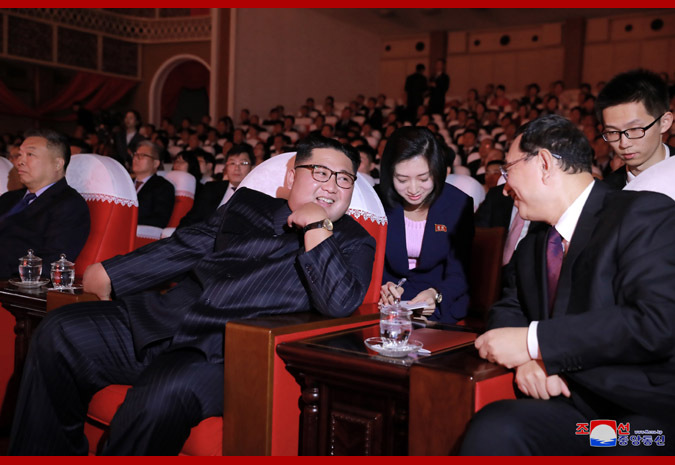 Supreme Leader of the Party, state and army Kim Jong Un was greeted at the theatre by Luo Shugang, minister of Culture and Tourism of China; Wang Yajun, deputy head of the International Liaison Department of the C.C., Communist Party of China; Li Qun, vice-minister of Culture and Tourism of China, and other members of the Chinese artistes delegation and Li Jinjun, Chinese ambassador to the DPRK. 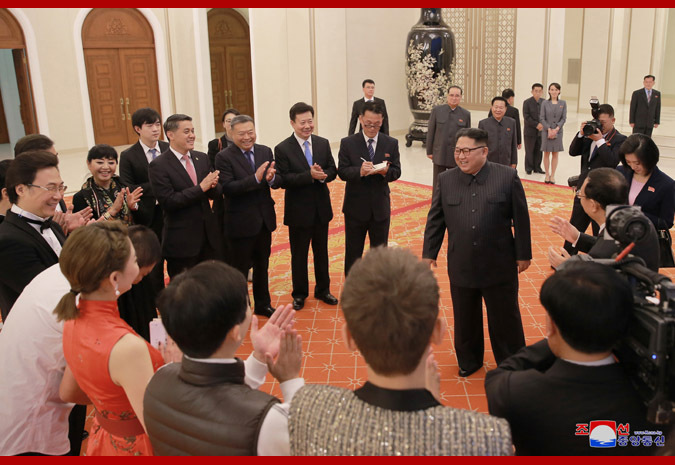 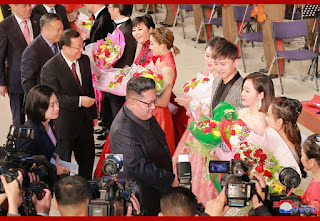 Kim Jong Un was presented with a bunch of flowers by Chinese artistes. 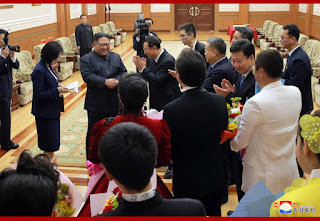 He expressed the belief that the Pyongyang visit by the delegation would be a significant occasion in more dynamically promoting the DPRK-China friendship, and had a photo session with the members of the delegation. 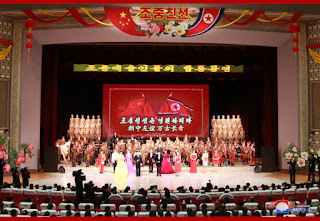 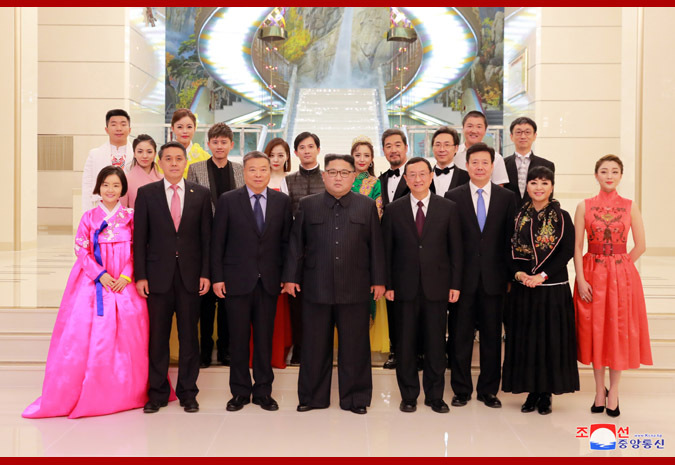 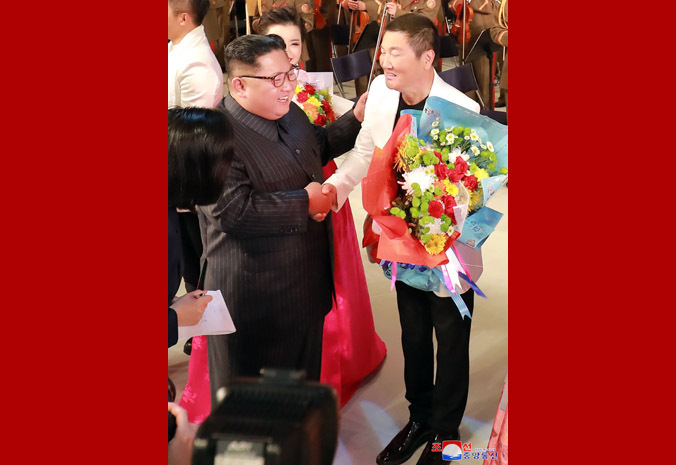 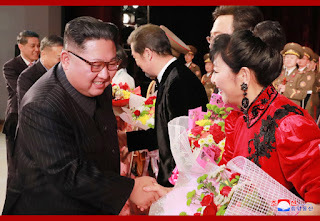 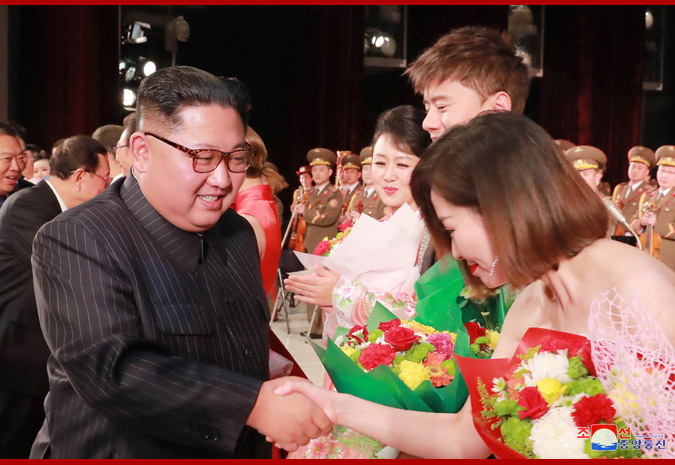 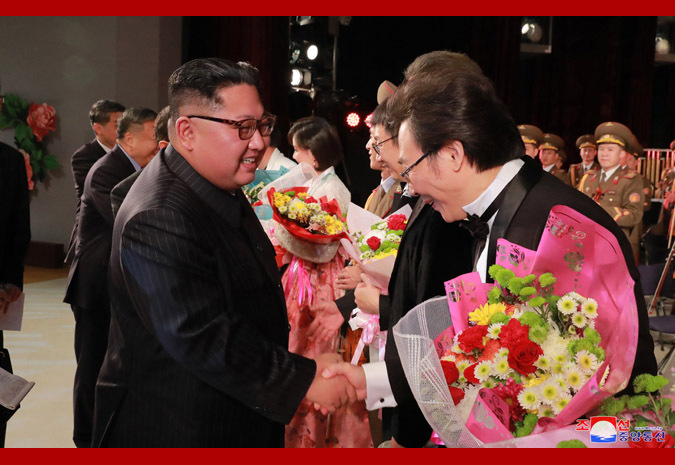 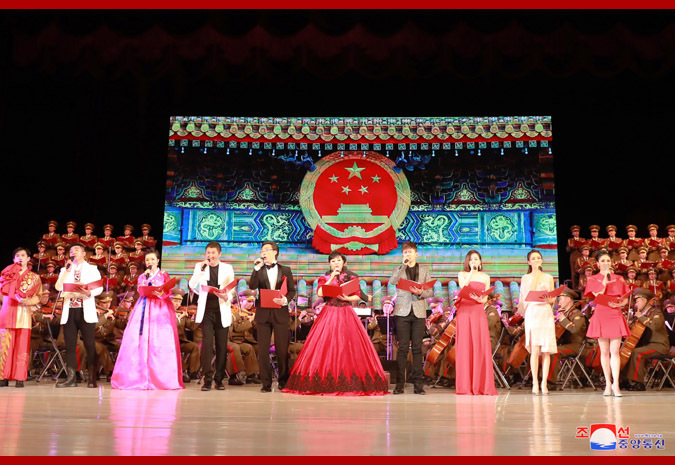 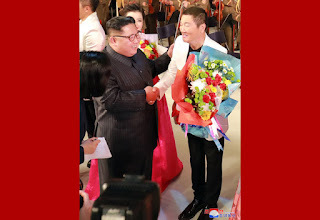 The joint performance provided under the deep care of the top leaders of the two parties and the two countries was all the more conspicuous as it was given by DPRK artistes and Chinese famous conductors, singers, instrumental players, dancers and film stars. 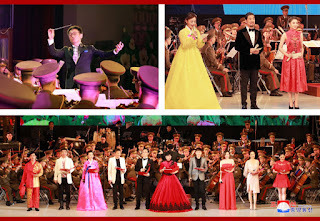 Put on the stage were famous music of the two countries. 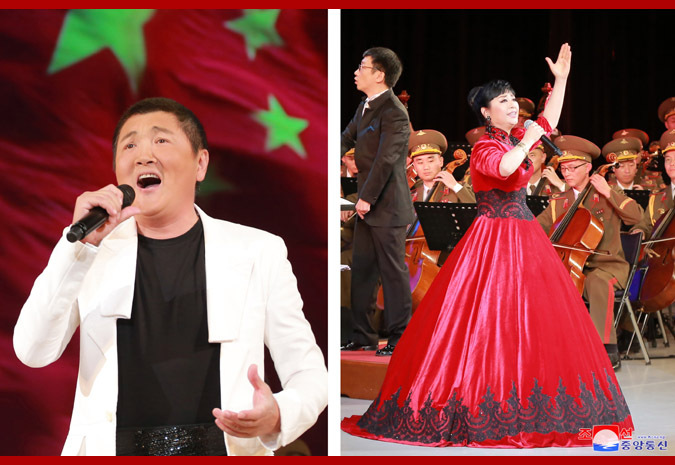 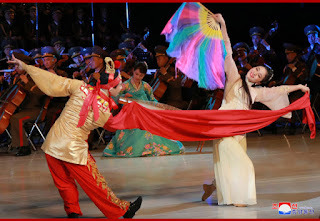 The performers showed the warm ideological and emotional feelings of the two peoples that have been linked in deep-rooted bonds of blood relations in the midst of the sacred struggle for the common cause through excellent musical representation, thus fully displaying the affinity and vitality of the art exchange between the DPRK and China of long historical tradition. 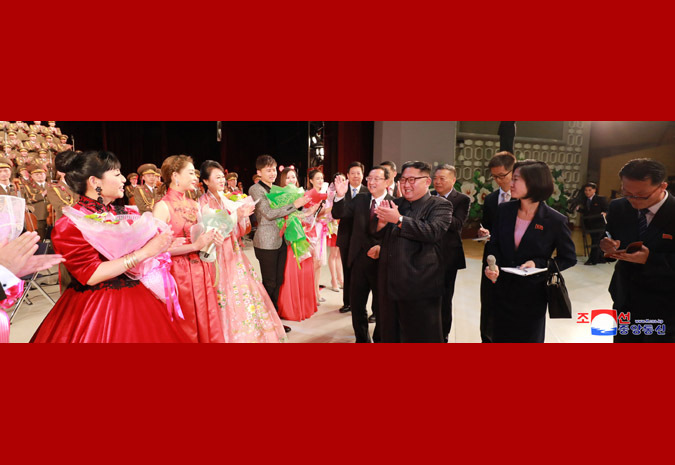 When the performance was over, a floral basket was conveyed to the performers and the audience presented them with bouquets. Kim Jong Un mounted the stage and shook hands with famous artistes of China one by one to congratulate them on their performance. He admired the famous artistes of China, saying that he was pleased to meet the renowned artistes of China. 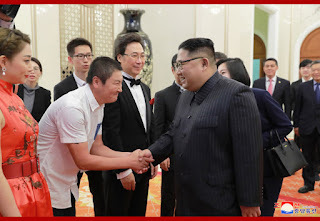 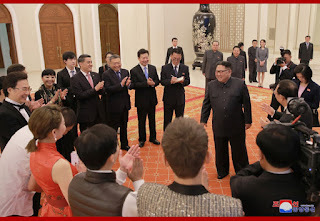 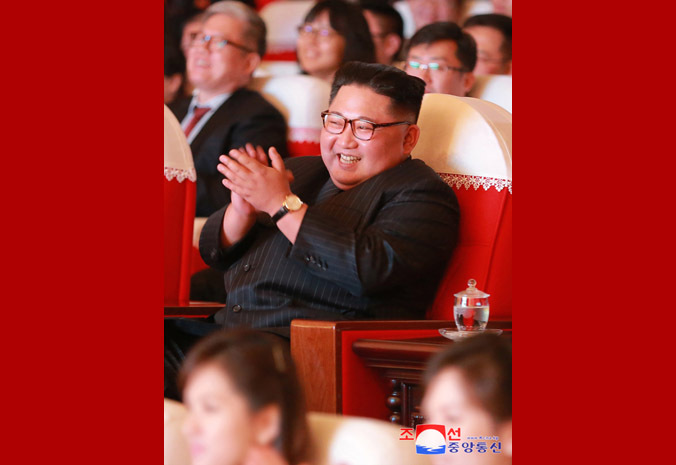 He expressed thanks to them for presenting such a wonderful performance in Pyongyang, noting that the performance was rich in the feelings, unique in personality and delicate in artistic representation and adding that one would hardly realize how time passed when seeing the performance and would want to see it once again. Watching the performance overflowing with the warm feelings of the two peoples of the DPRK and China, he was convinced of the bright future of the traditional DPRK-China friendship that stood all tempests of history to further effloresce, he said. 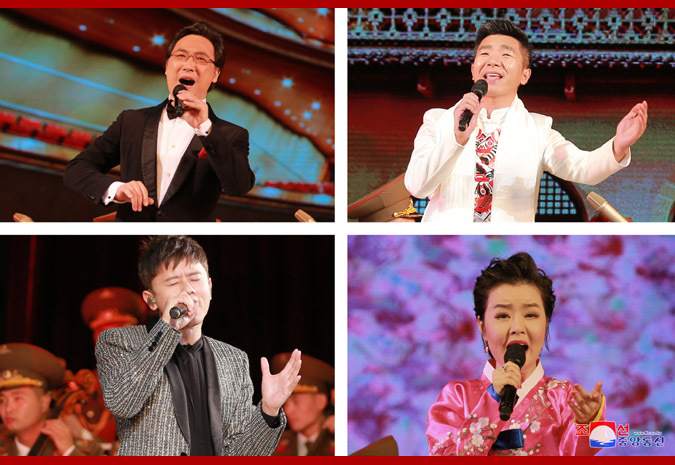 He sent heartfelt thanks to General Secretary Xi Jinping for making sure that the famous artistes of China are sent to Pyongyang to give such a fantastic performance and for showing interest in it to bring great delight to the Korean people. 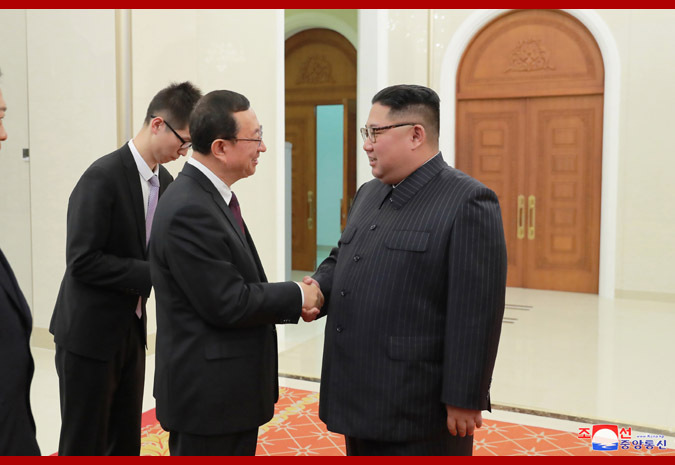 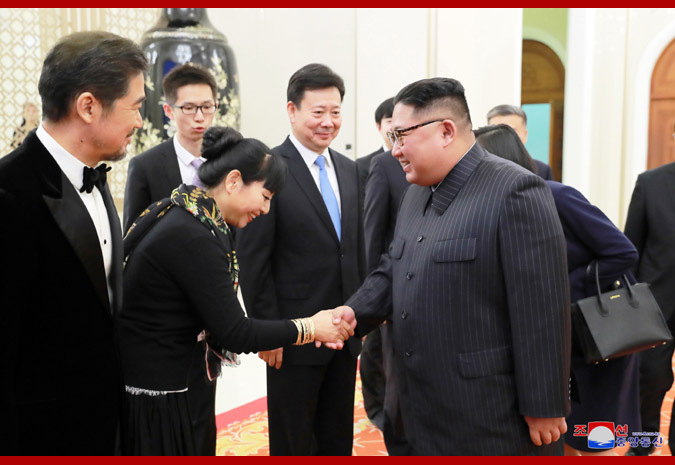 He also presented the warm greetings of himself, the party, government and the people of the DPRK to the Chinese party, government and the people.